This mural I just finished (2011) is on the side of a barn here in Prescott. 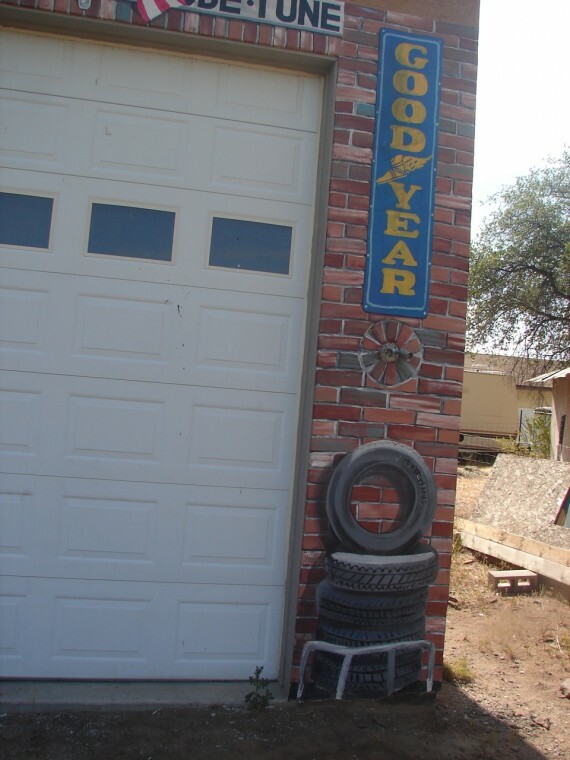 It was inspired by this giant sign the client had gotten from her recently deceased brothers’ estate. 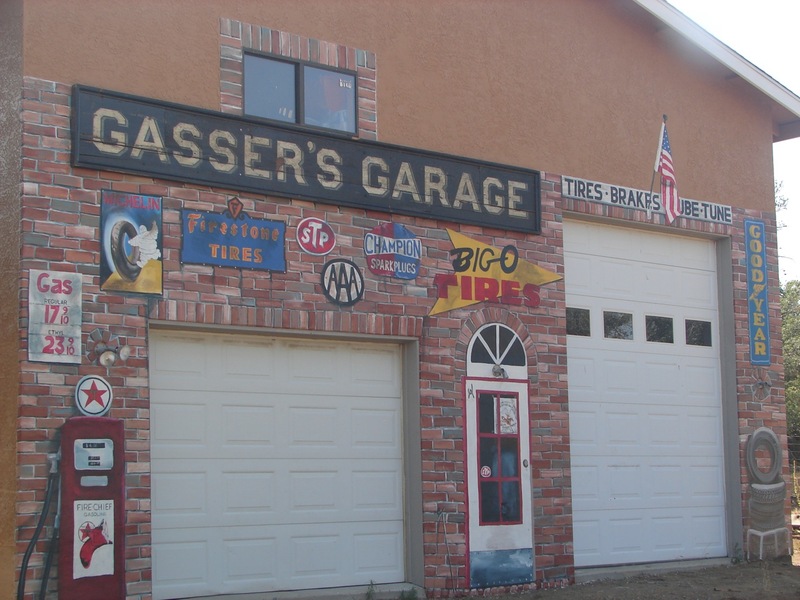 His last name was Gasser, and he had it made to hang in this huge garage he had for all of his toys. It had been sitting in this clients’ barn for a few months with her wondering what to do with it. I had been doing a couple of other murals for her in her home when she came upon the idea of turning their big, plain barn into what looks like a gas station, with the sign as the centerpiece. We both researched old 50’s-60’s gas stations, got lots of pictures and we got to work. My client had the stucco on the barn redone, both because it would be easier, faster and less expensive for me to paint on a relatively smooth surface, and also because the existing stucco was chipping off in several places. 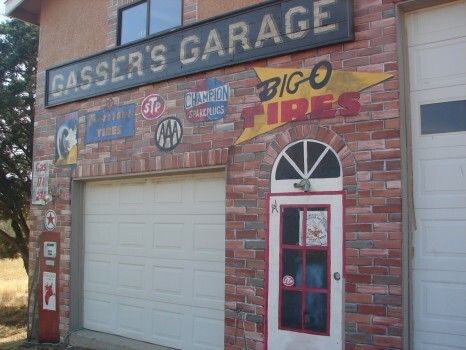 I got busy on the “GASSERS’ GARAGE” sign. It needed to be protected from the elements. Before, it had been inside, but now it would be outside in the elements. I put a couple of coats of matte clear coat on it and a little bit of repairs to the old wood, to still make the sign look old, but make sure it was stable. An aside: My client is a beekeeper. I was working just a few feet from the hives. While I was clearcoating the sign, one hive decided it was time to split in two! It was amazing to watch and my client gave me lots of education on bees. Unfortunately, one came up to me to check me out (they do that when they’re looking for a new home), “bumped” into my forehead and got tangled in my hair and sunglasses. I looked like Quazimoto the next day with my eye swollen shut. The little guy just scraped me, not a real sting though. Regardless, the whole thing was really cool to witness. Our next step was to hang this very heavy sucker! Luckily, the client has a business that employs several strong men, plus we had the help of my big strong and handsome brother Bill. We set my scaffold up and carefully and stoutly, we hung the sign. It’s not going anywhere! The sucker had to weigh 200# or more! Maybe I’m exaggerating some, but only a little. It was HEAVY. 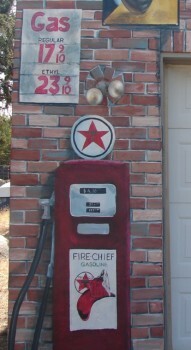 The first thing I painted was the old gas pump and the bricks behind it. It was the most fun thing about this mural for me, and I like to do the funnest things first. I’m the type of girl who likes to, if I’m going to eat dessert, will eat it first before the meal. I do that because after the meal I won’t appreciate it so much cause I’m so full. It tastes better before the meal. Same with painting. I like to do the coolest part first. Anyway, I knew I did well when my client’s son who was home from college looked out the houses’ back window and said “wow! Mom got that gas tank she was looking for! It’s so cool!”. He thought it was real. Our original plan for the gas station was to put all of the signs and stuff on the brick building, but have real gas pumps out front of the station. In our research, we found several gas stations where the pumps were up next to the building, so I suggested to my client that she might let me just paint the pump into the mural. It would be a lot less hassle and save her a ton of money. If she didn’t like it, I could always paint over it and she could run out and buy one later. (I knew that wouldn’t happen). Anyway, apparently it worked. Mission accomplished. Oh and ha ha, look at those wonderful gas prices, and the price someone just paid for over 26 gallons of gas. Those were the days! The window above the “gassers’ garage” sign was a trip to do. My scaffold are 2 layers tall. That’s about 20 something feet in the air, plus my 6′ frame. Then there’s the extension of my arm. I was up on my tippy-toes getting those top bricks. For safety though, I went inside the barn and opened the window and held onto the sill for dear life. Oh yeah, that’s a real window. The bricks I painted. I knew exactly where it would go. Perfect spacing. The signs were really fun to do. Researching the period signs was cool. I just love the internet and ebay! Some of these signs, if you were to buy the real McCoy, would cost thousands of dollars, but painted? About $20/sq’. Not a bad deal. I liked making them appear to be metal signs, some with “rust” on it’s scratchy surfaces. Some “bent” a little. All of them casting a shadow on the “bricks” behind them. In case you didn’t know the word for it, this is called trompe’ loeil, or “trick of the eye”. It’s my favorite thing to paint (today anyway).